The Buddha most commonly refers to Siddhārtha Gautama, who was a spiritual teacher from ancient India and the historical founder of Buddhism. A majority of twentieth-century historians date his lifetime from 563 BC to 483 BC. Did Buddha Believe in God? Siddhartha Gautama Buddha was a Hindu born in northern India, the son of a prince. He grew up in wealth and luxury and married happily. Meditating about the evils of the world led him to abandon his wife, his children, and his wealth and to wander about India as a beggar in search of truth. After many years of wandering and meditation, he found what he thought was truth. He formed a school of religious thought that was primarily designed to reform Brahmanism (Hinduism) and especially to overthrow the caste system. The people who followed him called him Buddha, which means the "Enlightened One". They later wrote down his sayings and established a canon. Siddhartha was born in a royal Hindu Kshatriya family. The time of his birth and death are uncertain: most early 20th-century historians dated his lifetime as c. 563 BC to 483 BC, but more recent opinion dates his death to between 486 and 483 BC or, according to some, between 411 and 400 BC. Buddha's family name was Gotama (Sanskrit Gautama), and it was probably by this name that he was known in life. In all likelihood it was after his death that his disciples bestowed on him a number of laudatory names, the most common being Buddha, i.e. "the enlightened". He was brought up by his mother's younger sister, Maha Pajapati. By tradition, he is said to have been destined by birth to the life of a prince, and had three palaces (for seasonal occupation) built for him. Although more recent scholarship doubts this status, his father, said to be King Śuddhodana, wishing for his son to be a great king, is said to have shielded him from religious teachings and from knowledge of human suffering. Like the newborn youths of his day, he must have spent some time in the study of the Vedas (véda, "knowledge"), the 'sacred' scriptures of Hinduism. When he reached the age of 16, his father reputedly arranged his marriage to a cousin of the same age named Yaśodharā (Pāli: Yasodharā). According to the traditional account, she gave birth to a son, named Rahula. Siddhartha is then said to have spent 29 years as a prince in Kapilavastu. Although his father ensured that Siddhartha was provided with everything he could want or need, Buddhist scriptures say that the future Buddha felt that material wealth was not life's ultimate goal. At the age of 29, the popular biography continues, Siddhartha left his palace to meet his subjects. Despite his father's efforts to hide from him the sick, aged and suffering, Siddhartha was said to have seen an old man. When his charioteer Channa explained to him that all people grew old, the prince went on further trips beyond the palace. On these he encountered a diseased man, a decaying corpse, and an ascetic. These depressed him, and he initially strove to overcome ageing, sickness, and death by living the life of an ascetic. Accompanied by Channa and aboard his horse Kanthaka, Gautama quit his palace for the life of a mendicant. It's said that, "the horse's hooves were muffled by the gods" to prevent guards from knowing of his departure. Gautama initially went to Rajagaha and began his ascetic life by begging for alms in the street. After King Bimbisara's men recognised Siddhartha and the king learned of his quest, Bimisara offered Siddhartha the throne. Siddhartha rejected the offer, but promised to visit his kingdom of Magadha first, upon attaining enlightenment. He left Rajagaha and practised under two hermit teachers. After mastering the teachings of Alara Kalama (Skr. Ārāḍa Kālāma), he was asked by Kalama to succeed him. However, Gautama felt unsatisfied by the practise, and moved on to become a student of Udaka Ramaputta (Skr. Udraka Rāmaputra). With him he achieved high levels of meditative consciousness, and was again asked to succeed his teacher. But, once more, he was not satisfied, and again moved on. Siddhartha and a group of five companions led by Kaundinya are then said to have set out to take their austerities even further. They tried to find enlightenment through deprivation of worldly goods, including food, practising self-mortification. After nearly starving himself to death by restricting his food intake to around a leaf or nut per day, he collapsed in a river while bathing and almost drowned. Siddhartha began to reconsider his path. Then, he remembered a moment in childhood in which he had been watching his father start the season's plowing. He attained a concentrated and focused state that was blissful and refreshing, the jhāna. According to the early Buddhist texts, after realizing that meditative jhana was the right path to awakening, but that extreme asceticism didn't work, Gautama discovered what Buddhists call the "Middle Way"—a path of moderation away from the extremes of self-indulgence and self-mortification. In a famous incident, after becoming starved and weakened, he is said to have accepted milk and rice pudding from a village girl named Sujata. Such was his emaciated appearance that she wrongly believed him to be a spirit that had granted her a wish. Following this incident, Gautama was famously seated under a pipal tree—now known as the Bodhi tree—in Bodh Gaya, India, when he vowed never to arise until he had found the truth. Kaundinya and four other companions, believing that he had abandoned his search and become undisciplined, left. After a reputed 49 days of meditation, at the age of 35, he is said to have attained Enlightenment. According to some traditions, this occurred in approximately the fifth lunar month, while, according to others, it was in the twelfth month. From that time, Gautama was known to his followers as the Buddha or "Awakened One" ("Buddha" is also sometimes translated as "The Enlightened One"). He is often referred to in Buddhism as Shakyamuni Buddha, or "The Awakened One of the Shakya Clan." According to Buddhism, at the time of his awakening he realized complete insight into the cause of suffering, and the steps necessary to eliminate it. These discoveries became known as the "Four Noble Truths", which are at the heart of Buddhist teaching. Through mastery of these truths, a state of supreme liberation, or Nirvana, is believed to be possible for any being. The Buddha described Nirvāna as the perfect peace of a mind that's free from ignorance, greed, hatred and other afflictive states, or "defilements" (kilesas). Nirvana is also regarded as the "end of the world", in that no personal identity or boundaries of the mind remain. In such a state, a being is said to possess the Ten Characteristics, belonging to every Buddha. He then set out to preach his gospel of deliverance, beginning at Benares. His magnetic personality and his earnest, impressive eloquence soon won over to his cause a number of the warrior caste. Brahmins, too, felt the persuasiveness of his words, and it was not long before he was surrounded by a band of enthusiastic disciples, in whose company he went from place to place, by making converts by his preaching. These soon became very numerous and were formed into a great brotherhood of monks. Such was the work to which Buddha gave himself with unsparing zeal for over forty years. At length, worn out by his long life of activity, he fell sick after a meal of dried boar's flesh, and died in the eightieth year of his age. The approximate date of his death is 480 BC. It is noteworthy that Buddha was a contemporary of two other famous religious philosophers, Pythagoras and Confucius. In the 'sacred' books of later times Buddha is depicted as a character without flaw, adorned with every grace of mind and heart. There may be some hesitation in taking the highly coloured portrait of Buddhist tradition as the exact representation of the original, but Buddha may be credited with the qualities of a great and seemingly good man. The records depict him moving about from place to place, regardless of personal comfort, calm and fearless, mild and compassionate, considerate towards poor and rich alike, absorbed with the one idea of freeing all men from the bonds of misery, and irresistible in his manner of setting forth the way of deliverance. In his mildness, his readiness to overlook insults, his zeal, chastity, and simplicity of life, he reminds one not a little of St. Francis of Assisi. In all pagan antiquity no character has been depicted as so noble and attractive. But the question remains, if Buddha was so seemingly good and praiseworthy, what ever kept him from finding the True Enlightenment: the Eternal and Incorruptible God? The short answer is that Buddha did not believe in God, nor did he attribute glory to his Creator, neither did he honestly seek after Him during his life. When reading on Buddha's life, one will quickly learn that the existence of God was one of the subjects on which he declined to make a definitive comment. Surely this was exactly the kind of topic that an 'awakened' being should pronounce upon, for the benefit of all. Pressed further on metaphysical speculation, which include queries about the nature of the cosmos and life after death, the Buddha is said to have explained that dwelling on such a question is not conducive to the elimination of suffering, which was the sole purpose of his teaching. Whenever he was asked a metaphysical question, he remained silent. Instead, he directed his disciples toward practical efforts. Questioned one day about the problem of the infinity of the world, the Buddha said, "Whether the world is finite or infinite, limited or unlimited, the problem of your liberation remains the same." Another time he said, "Suppose a man is struck by a poisoned arrow and the doctor wishes to take out the arrow immediately. Suppose the man does not want the arrow removed until he knows who shot it, his age, his parents, and why he shot it. What would happen? If he were to wait until all these questions have been answered, the man might die first. Life is so short. It must not be spent in endless metaphysical speculation that does not bring us any closer to the truth." For many Buddhists, they do not really care if there is a God. Whether He exists or not, it does not matter. For the Buddhist, his immediate problem are his personal problems; his sufferings. The Buddhist believes that he has within him the ability to overcome all his suffering and to do this he practises the teachings of the Buddha. Some Buddhist scriptures and some sects, like the Mahayana school, believe that gods exist, but do not consider that knowledge crucial to an individual's practice of Buddhist teachings since as incarnated beings, they too are bound to the wheel of Samsara and thus it is pointless to submit to them. The Buddha taught that we should not speculate about what we cannot know, and that speculation about God is pointless. Buddhists' priorities are release from suffering (by learning to cease striving after objects of desire and avoiding objects of discomfort) and direct experience of the true nature of reality. Many modern strains of Buddhism are atheistic in nature, thus creating a paradox as to why they are called a religion. They can be considered to be philosophies of life. Certain denominations, such as the Mahayana tradition, believe in Bodhisattvas, or quasi-divine cosmic beings that seek to benefit others by remaining in a state of Samsara, or eternal rebirth. These are prayed to, for advice and spiritual guidance, and often venerated as gods or goddesses. One doctrine agreed upon by most branches of modern Buddhism is that "this world is not created and ruled by a God." In general, Buddhists do not believe in God. "There is no almighty God in Buddhism. There is no one to hand out rewards or punishments on a supposedly Judgement Day. Buddhism is strictly not a religion in the context of being a faith and worship owing allegiance to a supernatural being." The Buddha himself rejected metaphysical speculation as a matter of principle, and his teachings focused entirely on the practical ways to end suffering. On the other hand, the Buddha did not explicitly rule out the existence of a God or gods. "Primitive man found himself in a dangerous and hostile world, the fear of wild animals, of not being able to find enough food, of injury or disease, and of natural phenomena like thunder, lightning and volcanoes was constantly with him. Finding no security, he created the idea of gods in order to give him comfort in good times, courage in times of danger and consolation when things went wrong. To this day, you will notice that people become more religious at times of crises, you will hear them say that the belief in a god or gods gives them the strength they need to deal with life. You will hear them explain that they believe in a particular god because they prayed in time of need and their prayer was answered. All this seems to support the Buddha's teaching that the god-idea is a response to fear and frustration. The Buddha taught us to try to understand our fears, to lessen our desires and to calmly and courageously accept the things we cannot change. He replaced fear, not with irrational belief but with rational understanding. "The second reason the Buddha did not believe in a god is because there does not seem to be any evidence to support this idea. "The third reason the Buddha did not believe in a god is that the belief is not necessary. Some claim that the belief in a god is necessary in order to explain the origin on the universe. But this is not so. Science has very convincingly explained how the universe came into being without having to introduce the god-idea. … Some claim that god is necessary in order to give man salvation. But this argument only holds good if you accept the theological concept of salvation and Buddhists do not accept such a concept. Based on his own experience, the Buddha saw that each human being had the capacity to purify the mind, develop infinite love and compassion and perfect understanding. He shifted attention from the heavens to the heart and encouraged us to find solutions to our problems through self-understanding." Buddha, buddhism, atheism, agnosticism, like all false religions, know not God. Romans 2:14-16 is reiterating the truth that the natural law is written on the heart of all men, so that all men know that certain things are against God's law and that certain things are in accordance with the natural law of charity, etc. Romans 2:14-16: "For when the Gentiles, who have not the law, do by nature those things that are of the law; these having not the law are a law to themselves: Who shew the work of the law written in their hearts, their conscience bearing witness to them, and their thoughts between themselves accusing, or also defending one another, In the day when God shall judge the secrets of men by Jesus Christ, according to my gospel." Although Buddha and Buddhists do not explicitly rule out the existence of a God or gods, they are, as St. Paul says in Romans 20, without excuse. St. Augustine and St. Thomas Aquinas explains this well in reference to persons who died ignorant of the Faith and without baptism. St. Augustine, Tractate 89, on John 15:22-23- "What, then, does He [Jesus] mean by the words, If I had not come and spoken unto them, they had not had sin? [John 15:22] Was it that the Jews were without sin before Christ came to them in the flesh? Who, though he were the greatest fool, would say so?... But when He went on to say, But now they have no excuse for their sin, some may be moved to inquire whether those to whom Christ neither came nor spoke, have an excuse for their sin. For if they have not, why is it said here that these had none, on the very ground that He did come and speak to them? And if they have, have they it to the extent of thereby being barred from punishment, or of receiving it in a milder degree? To these inquiries, with the Lord's help and to the best of my capacity, I reply, that such have an excuse, not for every one of their sins, but for this sin of not believing on Christ, inasmuch as He came not and spoke not to them." And in The Revelations of St. Bridget, Jesus says: "It is in accord with God's justice that entry into heaven must be gained through steadfast faith, rational hope, and fervent love. A person ponders more frequently and adores more lovingly that which the heart loves more and loves with greater fervor. So it is with the gods that are placed in temples - though they are not gods nor creators, since there is but one sole creator, I myself, God, Father, Son, and Holy Spirit. But the owners of temples and people in general love the gods more than they love me, seeking to achieve worldly success rather than to live with me. Buddha taught that sentient beings are trapped in an eternal cycle of death and rebirth (samsara), characterized by continual dissatisfaction or suffering (dukkha). Everything in samsara is impermanent, and that as long as people remain attached to a sense of self—to possessions, to power, to food, to pleasure—they will also remain trapped in the birth-death-rebirth cycle. Since nothing is permanent (anicca), what lives on from one existence to the next is not a "soul," but a set of experiences. A basic teaching of the Buddha is that there is no soul (anatta). According to Buddha, Enlightenment lay in the "middle way," a path of moderation away from the extremes of self-indulgence and self-mortification. The Buddha's teaching is often summarized as the "Four Noble Truths"—1) to live is to suffer (Dukha), 2) suffering is caused by desire (Tanha, or "attachment"), 3) one can eliminate suffering by eliminating all attachments, and 4) this is achieved by following the noble eightfold path. The "eightfold path" consists of having a right 1) view, 2) right intention, 3) right speech, 4) right action, 5) right livelihood, 6) right effort (properly direct energies), 7) right mindfulness (meditation), and 8) right concentration (focus). According to tradition, the Buddha emphasized ethics and correct understanding. He questioned everyday notions of divinity and salvation. 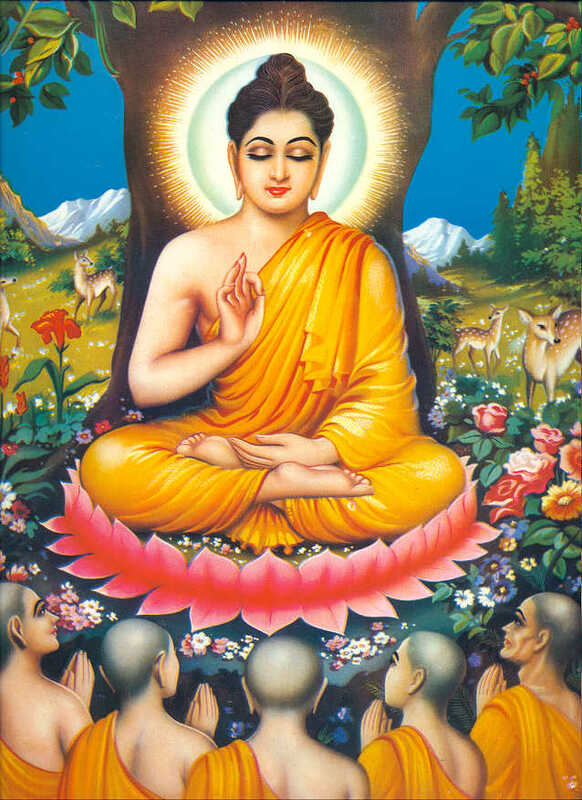 He stated that there is no intermediary between mankind and the divine; distant gods are subjected to karma themselves in decaying heavens; and the Buddha is only a guide and teacher for beings who must tread the path of Nirvāṇa (Pāli: Nibbāna) themselves to attain the spiritual awakening called bodhi and understand reality. The Buddhist system of insight and meditation practice is not claimed to have been divinely revealed, but to spring from an understanding of the true nature of the mind, which must be discovered by treading the path guided by the Buddha's teachings. The fundamental tenets of Buddha and Buddhism are marked by grave defects that not only betray its inadequacy to become a religion of enlightened humanity, but also bring into bold relief its inferiority to the religion of Jesus Christ. In the first place, the very foundation on which Buddhism rests—the doctrine of karma with its implied transmigrations—is gratuitous and false. (Karma is action or deed, seen as bringing upon oneself inevitable results, good or bad, either in this life or in a reincarnation). This pretended law of nature, by which the myriads of gods, demons, men, and animals are but the transient forms of rational beings essentially the same, but forced to this diversity in consequence of varying degrees of merit and demerit in former lives, is a huge superstition in flat contradiction to the recognized laws of nature, and hence ignored by men of science. Another basic defect in Buddhism is its failure to recognize man's dependence on a supreme God. By ignoring God and by making salvation rest solely on personal effort, Buddha substituted for the Brahmin religion a cold and colourless system of philosophy. It is entirely lacking in those powerful motives to right conduct, particularly the motive of love, that spring from the consecration of religious men and women to the dependence on a personal all-loving God. Hence it is that Buddhist morality is in the last analysis a selfish utilitarianism. There is no sense of duty, as in the religion of Christ, prompted by reverence for a supreme Lawgiver, by love for a merciful Father, by personal allegiance to a Redeemer. Karma, the basis of Buddhist morality, is like any other law of nature, the observance of which is prompted by prudential considerations. Not infrequently one meets the assertion that Buddha surpassed Jesus in holding out to struggling humanity an end utterly unselfish. This is a mistake. Not to speak of the popular Swarga, or heaven, with its positive, even sensual delights the fact that Nirvana is a negative ideal of bliss does not make it the less an object of interested desire. Far from being an unselfish end, Nirvana is based wholly on the motive of self-love. It thus stands on a much lower level than the Christian ideal, which, being primarily and essentially a union of friendship with God in heaven, appeals to motives of disinterested as well as interested love. Another fatal defect of Buddhism is its false pessimism. A strong and healthy mind revolts against the morbid view that life is not worth living, that every form of conscious existence is an evil. Buddhism stands condemned by the voice of nature the dominant tone of which is hope and joy. It is a protest against nature for possessing the perfection of rational life. The highest ambition of Buddhism is to destroy that perfection by bringing all living beings to the unconscious repose of Nirvana. Buddhism is thus guilty of a capital crime against nature, and in consequence does injustice to the individual. The Buddhist ideal on earth is a state of passive indifference to everything—even to God Himself. How different is the teaching of Him who came that men might know who God is so that they may have life and have it more abundantly! Who is God? And is the Christian God the One and Only True God? Who is Jesus? And is Jesus Christ True God?